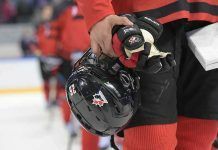 The International Ice Hockey Federation (IIHF) has announced the officials assigned to the 2018 IIHF World Championship, a list that includes four Canadians. Olivier Gouin (Terrebonne, Que.) and Brett Iverson (Richmond, B.C.) were selected as referees, while Dustin McCrank (Guelph, Ont.) and Nathan Vanoosten (Surrey, B.C.) were selected as linesmen. Officials working international competitions for all but the 2018 IIHF World Championship were announced by the IIHF in October, and counted 22 Canadians. 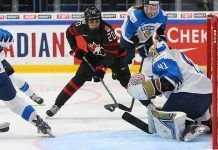 The assignments for the 2018 IIHF World Championship hosted in Copenhagen and Herning, Denmark, May 4-20, were released late last week. Gouin, Iverson, and Vanoosten most recently represented Canada as officials at the 2018 Olympic Winter Games in PyeongChang, South Korea. Iverson is returning to worlds for the third-consecutive year, having been a referee in France and Germany at last year’s tournament, while Gouin and Vanoosten will make their second appearance in as many years at the world championship. Although McCrank will be making his first appearance at the IIHF World Championship, his most recent international experience includes this year’s IIHF World Junior Championship in Buffalo, N.Y. McCrank served as a linesman during the tournament and officiated in the bronze-medal game between the United States and the Czech Republic. Ensuring that play is kept safe and fair for all sides, officials play a key role in the game. The Hockey Canada Officiating Program (HCOP) gives anyone that is interested an opportunity to officiate the sport of hockey. The HCOP offers six levels of officiating that provide basic to extensive training for those interested in officiating. Previous articleOilers Miss The Playoffs for the 12th time in the last 14 years-Now What?